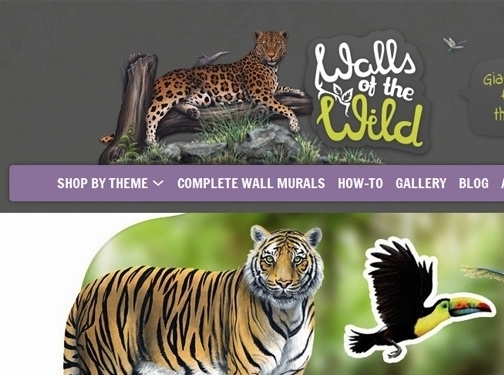 Walls of the wild are a family run business based in Milton Keynes and have been selling wall stickers since 2007. We offer a wide selection of wall murals and decals including Jungle Animals, Dinosaurs, Farm animals and even fantasy creatures! We sell individual stickers or complete wall murals in a variety of styles. Our Wall Stickers are very easy to use and are easily removed if needed. The stickers are suitable for many surfaces including walls, metal, wood and glass. All of our wall murals are made out of high quality vinyl and provide that wow factor that you are looking for. Visit our website to see the full range now! UK (Milton Keynes) based business - established in 2007 - providing wall stickers. Website includes e-commerce facilities, delivery and returns information, terms and conditions, blog, associations, contact form.